We are conveniently located only two minutes drive from the Airport in Melbourne, and offer all the comforts and conveniences you would expect and much, much more. Our dedicated staff, luxurious accomodation (which comprise beautifully appointed suites), and exceptional A La Carte Restaurant will ensure that you have a pleasant and memorable stay. 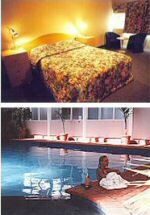 The Double Motel Room at Ciloms Airport Lodge offers the ideal budget motel accommodation close to the Melbourne Aiport terminal.